How are you all doing? the third advent weekend is right in front of us and I hope you’re all having a joyful time. I just got home from our weekly knitnight, had some lovely hungarian food and now try to enjoy my time with my boyfrind, candles are burning, light is dimmed. He’s having some midnight snack and I type at the computer. All in all it’s nice and cozy. 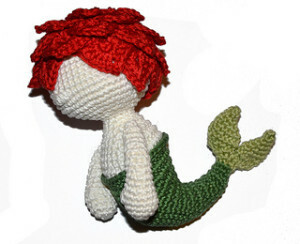 Today we will almost finish our little mermaid friend. Klara will finally get her well deserved arms. What’s a mermaid to do without arms? She’ll be pretty helpless..
so download the 5th part of the CAL and make some arms, to hug and embrace her. Or check your ravelry library for the updated pattern.